So I find myself continuing an impromptu tour of North Yorkshire's Cistercian Abbeys... of which there are several but I'm sticking to the principal three: Fountains (tick), Rievaulx and Byland - the three 'shining lights' of the Cistercian Order as they came to be known. Located just six miles or so apart on the edge of the Yorkshire Moors, even over 900 years on, it's easy to see why the monks were attracted to this beautiful, remote wilderness. The approach to Rievaulx is an event in itself. Anticipation builds as you follow the narrow road which runs steeply down the densely wooded valley of the River Wye. The road bends suddenly to reveal the mighty stone ruins which stand completely alone against fields, woods and sky - just as it did five hundred years ago at the height of its power. In spite of its magnificent scale, what remains of the great church and abbey buildings is surprisingly austere with little decoration - seemingly so as not to detract from the monks' simple lifestyle. In its hey day, the abbey was home to 140 monks and some 500 lay brothers who worked the abbey estate. Records of the wool it sold show that they owned around 12,000 sheep in a series of sheep stations across 6,000 acres. 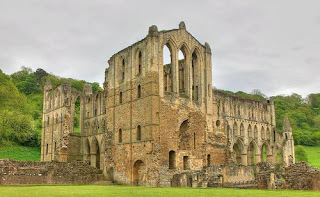 In 1142, the monks at Rievaulx got a nasty shock when another group of Cistercians set up home less than a mile away in Byland. The two monasteries were within the sound of each others' bells which caused confusion and quarrels ensued. 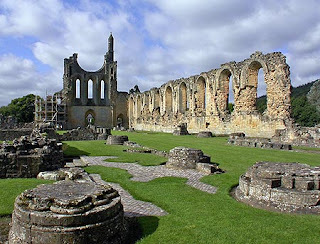 A few years later the Byland monks were persuaded to move to land a few miles up the road near the village of Wass, on which they refounded Byland Abbey and its ruins still preside today. Visible from the road, it's clear that time has treated Byland less kindly. Piercing the sky like a stone finger, the remains of what must have been a spectacular rose window suggest that Byland was much more extravagantly decorated. On closer inspection, you can see the remains of glazed tile floors and ornately decorated pillars.